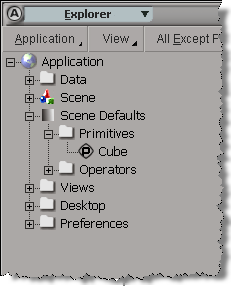 The first time you create a primitive, or create an operator, Softimage creates a property under the Scene_Defaults. This property serves as a “cache” for the default values in the PPG for a primitive or operator. Each time you create a new primitive (or operator), it will take the default PPG values from the Scene_Defaults. So for example, after you create one primitive cube, you could go to the Scene_Defaults and change the default cube size to 1. These scene defaults are not saved with the scene, which limits their usefulness. There may have been grander ambitions for the Scene_Defaults back in the very early days, but they were abandoned and it remains an incomplete, undocumented feature.